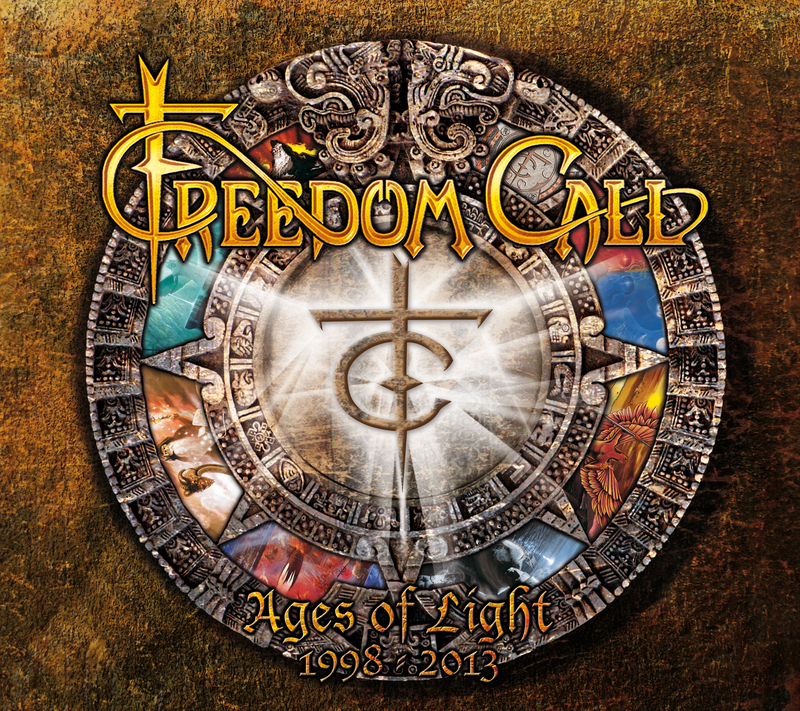 Rock & Metal 4 You: CD-Review: Freedom Call - "Ages Of Light"
It was 15 years ago, when four guys from Nuremberg (Germany) decided to kick all those metalheads, which thought metal is all about evil and darkness, in their asses. I think no other band has marked the term "Happy Metal" so much, like FREEDOM CALL. It was a simple concept: more melody and good-time-feeling, less growls and lyrics about dead and violence. At this time Freedom Call showed that (Heavy) Metal can be much fun and fortunately they didn't change much of this concept in their career. With "Ages Of Light" we get the first best of and a nice cross-section of the last 15 years ... with some surprises. 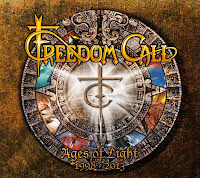 "Ages Of Light" contains 2 CD's: the first one is the true best of, while the second CD has some very interesting new versions of well-known Freedom Call hits to offer. Let's start with the first one: What is immediately striking is the fact that all the songs on the album are in a chronological order. So the first tracks are taken from the first albums and the last ones from the new records. I like this very much, because so you can see how the band developed and this is what a best-of should always do. So the album starts with "We Are One", which is a good metal anthem, but over the years I forgot that song, so to me this is not the kind of song which has to be on a Freedom Call best of, but the following tracks definitely deserve it. 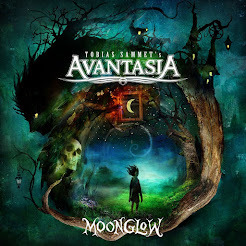 "Tears Falling", "Freedom Call" and "Farewell" are all very strong Metal anthems with tons of hooks and catchy melodies - just everything you expect from this band. So after these three tracks I got totally into this Freedom Call fever again. I've to say I don't like it if bands think they have to add live-versions into a best of, because I always want to hear the originals. "Metal Invasion" is such a live-track, which is fortunately very good mixed so you don't notice so much that this is not an original recording. By the way: great song. And so we get to the numerous songs of the third Freedom Call album "Eternity", which belongs to one of my all-time-favorites of this band. "Warriors" is one of the best Metal songs ever written. I remeber when I played air guitar to this tune after I've listened to it years ago. Good old times. What a stunning chorus and amazing guitar parts. I also love the next song: "Land Of The Light" - some kind of the Freedom Call-version of "The Final Countdown". Yes, at this time Freedom Call were definitely on the top of their songwriting skills. So I would have liked to have much more from "Eternity" on here. For example I miss the really beautiful power ballad "Turn Back Time". Yes, I know it's hard to pick just some songs from each record but this track has to be on a Freedom Call best of in my opinion. The following "Hunting High And Low" and "Mr. Evil" are always live favorites on the shows of this band. I don't really know why, because to me they can't keep up with the songs Freedom Call did before. Their album "The Circle Of Life" had much more to deliver. I think of "The Eternal Flame" or "Carry On". Sadly Chris and his bandmates didn't choose them to appear on this best of. "Far Away" was one of the songs, which I enjoyed the most on their album "Dimensions". So I'm really happy that this song made it. I like the bagpipes in the background. With "Thunder God" we reach their concept album "Legend Of The Shadowking" and Freedom Call added again a live version of the song "A Perfect Day". Why? Maybe because this one is a real feel-good gem. We'll never know, but of course one of my favorite Freedom Call tracks. To my surprise we get in the end of this record four (!) songs of Freedom Call's latest album "Land Of The Crimson Dawn". The good thing is: they really captured the best songs of this album. Especially "Hero On Video" and "Back Into The Land Of Light" show every trademark this band has to offer. Great! Now let's talk about the bonus CD: As I said we get six different new versions of well known Freedom Call songs ... and when I say "different" I really mean MUCH different. Freedom Call are brave and mix their songs with totally different music genres. It's clear that it's all about fun here and the whole band shows that they don't take themselves too serious. And that is what Freedom Call wants from you: to take a look at these songs with a wink and a smile on your face. I had fun to listen to "Rockin' Radio" in the Killerbilly version or "Metal Invasion" with folk elements. The Reggae version of "Mr. Evil" is also easy to listen to, but not my taste. I laughed so much when I heard the Ska-Version of "Hero On Video". How crazy sounds that? Freedom Call also dare to do a swing version of "Age Of Th Phoenix", but somehow it works. "Freedom Call" reminds you of typical campfire-songs. Very nice sung by Chris Bay, but a bit boring to me. So is this best of finally worth the money? Yes definitely, especially if you haven't all albums you'll get a really good survey of the creation of this band. Freedom Call die-hard-fans get also some really interesting new versions, so this best of is a good package for each melodic metal fan out there. And if you haven't heard from Freedom Call so far, don't miss their album "Eternity" - you can buy this one blindly! Hopefully we will hear much more of this band in the next 15 years!